Tim Gunn On The Project Runway Finale: "It Was Looney Kajooney Land"
It was looney kajooney land, let me tell you. The backstage at Bryant Park is always crowded -you've filled the space to capacity, so we have a ton of hair people, makeup people, models, dressers and, because we couldn't have any of the designers revealed to the public at large, we had all 16 designers backstage. Thankfully we only had three people showing, and that's a record for us: It's always been at least four. That was the good news: There were no red herrings. Owing to the fact that we couldn't reveal to the audience who the finalists were, we wanted to tape their introduction before the audience came in. We had to do a pre-fashion show, and we taped the whole thing. Through the miracles of editing, it's going to look as though the designers are speaking to the audience, but there isn't one. We did the whole show; it was great. Then a volunteer at Bryant Park declared that the models should get out of their looks - it takes forever to get them into them, up over the head with the hair and makeup. I was distracted by something, then I'm paying full attention backstage and the models are getting undressed. I said, "Halt! What is happening here?" The head dresser said, "I'm getting them out of their clothes." "Why?" "Well, they're going to steam them." That's when I said, "I am about to lose it, and everyone's going to stay in her clothes! PERIOD." Every season prior to Season 6 has had a "villain." There really isn't one this season… this season there wasn't really a person for whom I have antipathy, like Kenley [Collins]. Blech. Before that, Victoria Hong, before that, Vincent Libretti. Irina is tenacious. She really wants it. We had a very long lunch with Irina and her family, and, oh my God, talk about the nut not falling far from the tree. Her mother was saying things like, "If Irina doesn't win, she better not come home," and I could say she's already a winner. Also, Irina was my student. But! 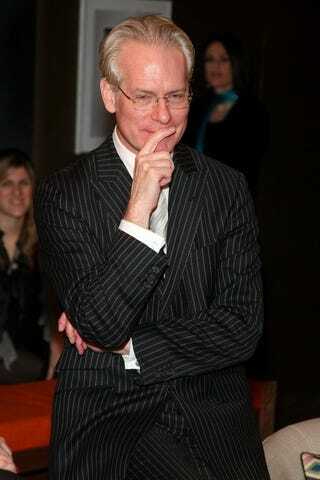 Tim Gunn thought that Ra'mon should have gone home! I was absolutely confident that the Ra'mon [Coleman]and Mitchell [Hall] team would both go home, and the fact that Ra'mon won that challenge still has me spinning in my chair. I was horrified by what he designed — that neoprene horror. Nina [Garcia] had a filibuster in support of that look. The other judges were aghast, but she said, "This is the only look that is remotely innovative." Well, innovative it was; good it wasn't. As for the judging in Season 6, Tim admits: "It wasn't good not having Michael [Kors] and Nina as much this season." And he hints that the Season 7 designers may be ingrates: "I will say that in Season 7 there are a number of designers who throw me under the bus." Plus, the Season 7 kids dilly-dally: "It's also the season of the sashay — no one other than me moves with any degree of urgency. No matter what, they sashay. I don't even have the adequate words to describe how mad and frustrated I would get: "We have to get down to the runway right now!" and they'd just kind of glide along through the workroom." "It not only looks ugly - I don't believe it's something you get used to and then think is pretty — it looks like the individual has a deformity. It looks like the devil's spawn. It's really horrifying."